Michelangelo.We all know how extraordinary, legendary and almost supernatural Michael Jackson was with dance moves, a style that nobody else could mimic, much less reinvent. 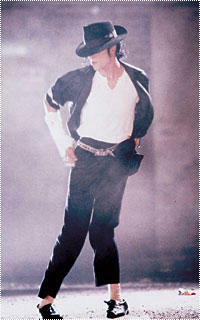 Jackson was not trained in dance or singing, yet has changed pop culture forever. That is God sent. That is the expression of a man who wanted to transcend death by attaching his personality to his art, which will then live forever. He said in his last interview: “… to escape death I attempt to bind my soul to my work. ” As a true icon and legend he has forever engraved his legacy in the history books as the greatest performer ever. Jackson’s tragic death made me compassionate and angry at the same time. Two questions are definitely raised by his sudden passing and the way he was forced to live. First, when will the medical community realize that the solution does not lie in prescription drugs? Hanging around celebrities for recognition and giving them drugs in order to get into their good graces is not helping their heath but rather hastening their death. Now that he is gone, it is time to appreciate him and his talents for what they really are, and not what a fashionable and sensational interpretation describes them to be.